Welcome to Chesterfield Towing Inc., Chester’s premier towing service since 1983. We are a proud local, family-owned and operated small business, meaning we never put anything above our clients’ needs, security and convenience. Get in touch anytime to learn more about our business. 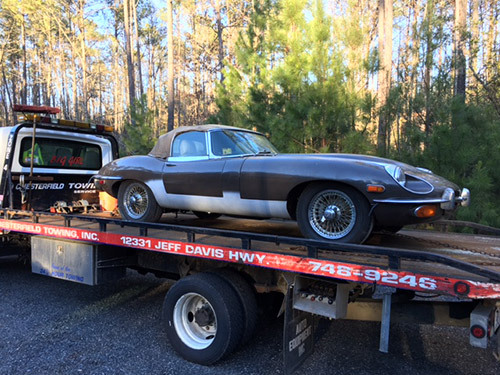 When you are stuck on the side of the road with a car that just will not start, what matters most o you when hiring a towing service in Richmond, VA? Do you value flashy signage, a huge company and fancy looking equipment? Or do you want a towing business that is honest, reliable, experienced and friendly? If you picked the latter, then Chesterfield Towing Inc. is the towing service for you. Since 1983, our small, family-owned and operated business has provided reliably effective and experienced towing services. Our services include, but are not limited to, the following: light towing, medium towing, jump starts, winch outs, 24-hour emergency towing and any other towing needs. We are a locally owned and operated small business in Richmond, VA.
Our drivers are fully bonded, licensed and insured by the state of Virginia. Our services include emergency towing, jump starts and much more. We have been serving the greater Chester area since 1983. We're now open 24 hours a day, 7 days a week for your convenience! "This is definitely the best Towing Service I have ever delt with. Chris did an awesome job! He gave me a time and was there at that time. I..."
"The best Towing company around. Quick service, and very friendly. Will definitely be using them again in the future!!" "These guys were very professional and also cost-friendly. They certainly did get to me within 30 minutes and that was awesome compared to th..."
"What a wonderful company. Towed my car and even put the key in the Dropbox for me. Even got a call back letting us know it was dropped off a..."
"Thank you so much for getting me so quickly. Chris the guy that towed me got there so quickly and make sure everything was okay! He was so a..."
We are available 24/7 for your emergency towing needs, so please call Chesterfield Towing Inc. for assistance today!